According to de Mortillet’s original catalogue, these textile heart amulets contain pieces of Easter bread and were worn around the neck. They are listed as coming from St. Michael’s Convent in Kiev, Ukraine, and were collected sometime by 1931 (the year of de Mortillet's death). Bread-making is an important aspect of Ukrainian Easter traditions; paska and babka are two round shaped sweet breads served at Easter. Babka is either iced or left plain, whereas paska is elaborately decorated with symbolic motifs made of dough, such as crosses, flowers and solar signs, or other religious symbols. Paska is traditionally made by women, and whilst it is being baked various ‘magical gestures’ and ‘incantations’ are used to ensure that the bread is a success. For example, as the dough is being prepared the person making it must maintain ‘pure thoughts’, and while it is in the oven no one is allowed to sit down or make loud noises out of fear that the bread might collapse. 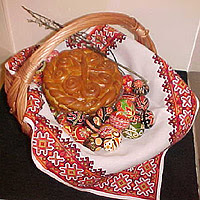 After the bread is baked it is wrapped in rushnyk, a ritual cloth, or placed in a basket with a newly embroidered cloth. Other Easter foods, such as eggs, salt, butter, cheese, and horseradish, are also added to the basket. Then on Easter Sunday the basket is taken to church to be blessed by the priest, after which it is taken home to be eaten. However, pieces of the consecrated Easter bread also become amulets, for example, to protect fields against hail, or to ward off ‘evil influences’. And, colourfully decorated Easter eggs (pysanky and krashanky), another important part of Ukrainian tradition, were supposed to cure a person of illness when hung on a piece of string around the neck. So, perhaps these textile heart amulets from St. Michael’s Convent were worn to protect the wearer from evil or sickness, or just as a reminder of the meaning of Easter. and were decorated using a 'resist-dye' (batik) process. It’s amazing how three small amulets can lead you into an exploration of a different Easter tradition. Hopefully you will all be inspired to try making your own Easter bread or having a go at painting some eggs this Easter weekend. The Small Blessings team wish you a very Happy Easter!